Hipster trend no. 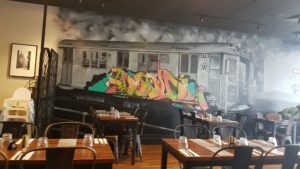 54 – open a café in a previously uncool suburban shopping strip, add some bare brick and graffiti, offer simple but appealing and well-cooked fare, and voila – you have a bustling hipster-cool business. Hipster-cool has come to the semi-rural eastern Brisbane suburb of Gumdale in the form of Cement. It’s so cool even Brisbane locals would be forgiven for not knowing where Gumdale is, let alone Cement. A lot of people are seemingly discovering this sleepy suburb though, because Cement is busy, and for good reason. We arrived without a reservation at the 11:30am opening time on Mother’s Day. Not good planning – every table is booked out. But the owner hates to turn anyone away so he pulls over a table and a high chair for bub, and tells us we can stay as long as we like. In fact, the service is the stand-out feature of Cement, attentive and friendly, but not overbearing The staff seem genuinely happy to have us there enjoying ourselves rather than rushing us out the door. The décor is urban cool, but I do wonder what urban cool has to do with a place like Gumdale. A mural of a graffiti-laden New York City subway train occupies an entire wall, spray-painted on the bare brick and contrasting sharply with the horse paddocks outside. Conscious of being a burden to the staff on such a busy day we order quickly from the simple but well-rounded menu. The four different pasta dishes sound hearty and delicious, and the burger-connoisseur in me wants to try every burger on the menu. I end up ordering that hipster staple, lightly dusted salt and pepper squid with lemon yoghurt sauce, while the wife orders the falafel and haloumi on Turkish bread. The meals are quick to arrive and generous in size, particularly given the prices. $12 burgers and $16 mains are hardly outrageous. There was much more than a hint of lemon in the yoghurt sauce which was unfortunate but the calamari was cooked to perfection and the burger was fresh and dripping with chutney goodness. The wife had been keen to try Cement after seeing it on social media, and I can see why it is creating a buzz. I’ll be back if just to try the rest of the burger selections. If the hipster trend brings well-priced, appealing food to a little suburb like Gumdale then I’m all for it.